How Do You Plant Ground Cover or Flowers Under Trees? There is every reason to turn the ground area beneath trees into space for flowers or ground cover plants rather than grass. These areas are notoriously poor places for grass to thrive, since they are typically pretty shady and the trees gobble up a lot of the soil moisture, making it difficult to grass to thrive. And mowing around trees always poses the risk of damaging the bark of the tree with your mower or with a string trimmer, which can be especially serious when the tree is young. Finally, converting the area beneath the tree is good for the overall health of the tree, as the care you give the flowers or other plants—the extra water and food—will also assist the tree in meeting its needs. However, one of the most common ways to plant flowers under trees is also one of the worst. The approach many people take is to cover the area under the tree with a load of loam, then try to grow perennials in that soil. Sometimes they build a circular or geometric raised bed around the trunk of the tree to put a full 8 to 12 inches of extra soil around the tree. As logical as that approach may sound, it fails to take into account a fact about how trees grow: Tree roots need to "breathe." It's often believed that a tree's roots extend very deep into the ground and outward for long distances. If this were the case, there would be less likelhood of damaging a tree by covering a small area immediately around the tree. But in reality, nearly all tree species have their roots rather close under the surface of the soil, and even fewer send down very deep tap roots into the earth. And most of the critical roots are the very fine, fibrous roots lying especially close to the surface. These are essential for the tree to absorb oxygen, and if you bury these roots by more then a very few inches, you may well kill the tree by cutting off its oxygen supply. There are, however, ways to successfully plant flowers or other ground cover plants under the tree. A small amount of soil and compost added to the ground around the tree will not seriously hinder the tree's ability to obtain oxygen; in fact, the roots of growing plants will serve to loosen and aerate the soil and actually help the plant obtain its oxygen. If soil is added very gradually, a tree can easily accommodate it by sending new roots up near the surface. Before simply planting flowers or other ground cover plants, spend some time preparing the site. If there is grass beneath the tree, manually remove it, so that it doesn't simply grow up through your newly established planting area. Removing it manually is the only way to effectively do this, since using chemical herbicide or using a smothering or solarization method poses dangers to the tree. A sharp spade is the best tool; cut the sod into chunks and pry it up to remove it. Pluck any remaining grass by hand. You may want to create an edging around the planting area to establish a boundary for your defined planting area. It's a good idea to extend this planting area out to the area where good thick lawn grass is growing. Any variety of materials can be used to form edging, including flexible plastic edging, or bricks or stones. Spread 1 to 2 inches of good quality garden soil over the area, along with 2 inches of compost. In extreme cases, when the area under the tree is dominated by a maze of exposed tree roots, your best option might be to spread a 3-inch layer of mulch over the unsightly exposed tree roots. A layer of fresh mulch will work wonders to spruce up your problem area. Then position container gardens over the mulch rather than planting in the ground. The choice of plants to use under trees is an important step, because conditions under trees are unique and not at all like the rest of your yard. The area under trees is usually quite shaded, especially with shade trees. This calls for flower and ground-cover species that thrive in part shade to full shade. The one exception is spring-blooming bulbs, which typically flower well before the tree canopy has leafed out, making the site much more sunny than it will be later in the season. The area may be quite dry, since trees are notorious for sucking up a lot of ground moisture. Unless you are willing to water a lot (several inches per week), make sure to choose plants that are quite tolerant of dry soil conditions. The soil may be somewhat devoid of nutrients, again because the tree will be consuming a lot of the major nutrients. It is probably best to avoid high-maintenance flowers and ground covers, unless you are willing to spend the time to feed regularly. Soil pH conditions may be unique. A tree can somewhat alter the chemistry of the soil beneath it. Pine trees, for example, can turn the soil pretty acidic over time, due to the pine needles decomposing on the ground. It is a good idea to take a soil test of the area beneath the tree, then choose plants well suited to the soil chemistry. After preparing the area under the tree, carefully dig small planting holes for your flowers or ground cover plants, using a sharp hand trowel. 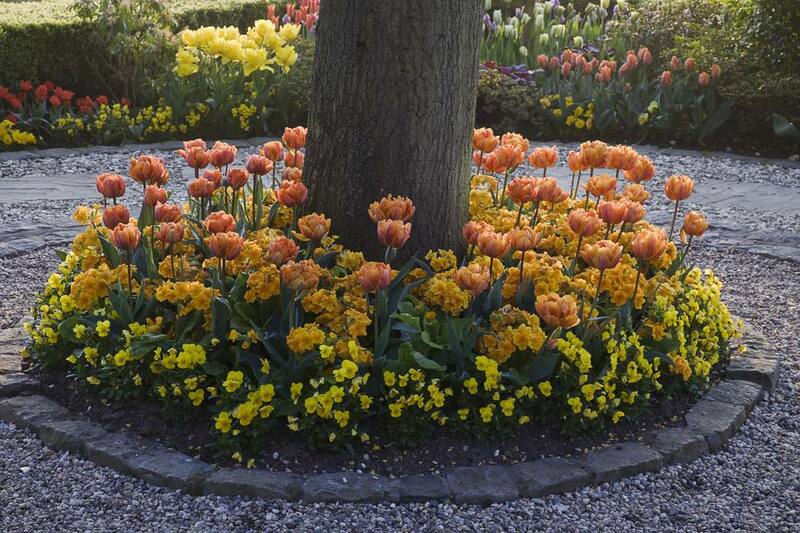 Unlike the way plants are installed in an open garden, where large planting holes are the norm, when planting under a tree, keep the planting hole just a bit larger and deeper than the plant's pot. This will help avoid excessive damage to the tree's roots. It is also best to choose the location of plants carefully to avoid the need to chop out larger tree roots. Do not worry if you need to cut through a few small, fibrous roots—the tree can easily tolerate this. Mulch in between the plants to minimize water loss and to promote weed control. Water thoroughly immediately after planting, and make sure to water regularly on an ongoing basis. Your tree will consume lots of water from the soil, which will dry your plants out quickly. Feed according to the needs of your plant. Be conservative in your use of chemicals and pesticides, since your tree may be sensitive to them.